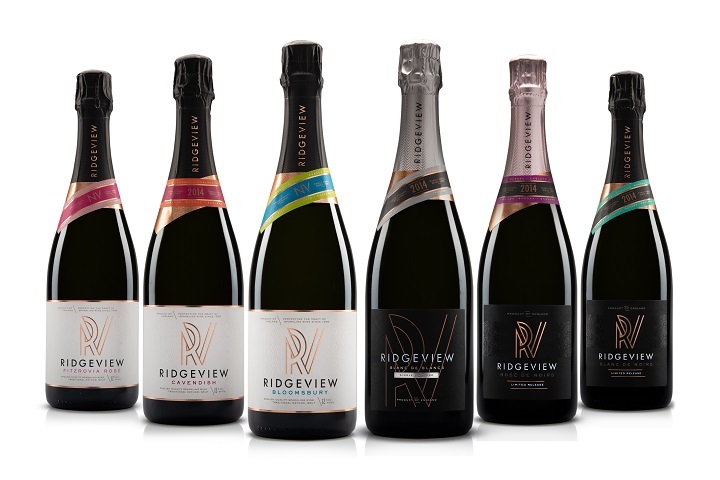 English sparkling wine leaders Ridgeview have launched their striking new branding. The new branding and labels are a bold move away from the previous classic and traditional packaging, to a contemporary, modern and proudly English design. Ridgeview, who were one of the first wineries to be solely devoted to the production of English sparkling wine, have led the way for over 20 years in national and international development of the category. The new look has a celebratory theme, inspired by founders Mike and Christine Roberts original ethos that ‘Life is for Celebrating’. Ridgeview launched the range with colleagues and friends from the wine trade and media at the art deco Beaufort Bar in The Savoy in London on 24th May. The Savoy Hotel provided the perfect back drop for the launch, where Ridgeview is proudly served in one of London’s oldest and most famous restaurants, Simpson’s in the Strand. The new logo development took inspiration from Ridgeview’s name, the glorious view of the South Downs Ridge from the vineyard and tasting room. The R wraps around the V in celebration of life, family and location. Ridgeview worked closely with the brand specialists CookChick Design in creating the new branding. Co-Founder & Director Lee Cook: “Being the most respected English Sparkling wine brand we were honoured to be the chosen agency for this exciting project. The objective was very simple…’To create category leading packaging to match their industry leading and multi award winning wines’. The statement from Ridgeview’s founder Mike Roberts “Life is for Celebrating” defined the pivotal centre of this project brief and one we were proud to have visually imbued in the big idea and the intricate details throughout the brand identity and packaging”. The colour palate in the neck label was inspired by the bottle caps that seal the wines whilst they are resting in the cellar. The signature wine ‘Bloomsbury’ also contains the colours of a blue and green wrap, where the vineyard and the South Downs meet the blue skies. Ridgeview was founded in 1995 by the Roberts family and are considered one of England’s finest and consistent English sparkling winemakers. The proud winners of numerous international sparkling wine trophies, Ridgeview wines have been served at four Buckingham Palace State Banquets, the official sparkling wine of No. 10 Downing Street and now exported around the globe. The second generation of the Roberts family, daughter Tamara and son Simon continue to develop Ridgeview as a pioneer within the wine industry. Posted in Consumer News and tagged English Sparkling Wine, Sussex, Ridgeview.